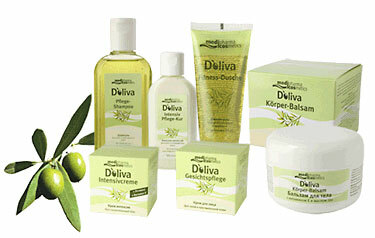 Doliva olive oil skin care products from Medipharma Cosmetics are made with extra virgin olive oil from Toscana. For centuries olive oil has been known to promote a smooth, radiant complexion, help maintain smooth, moisturized skin, and add shine to hair. From October to January the olive harvest in Buti, Toscana on the "Strada del Olio" is running at full speed. The extra virgin olive oil won from these olives is among the purest, and specially selected for the production of Medipharma Cosmetics' Doliva olive oil skin care line. Even today the Buti olive is picked by hand, because mechanical harvesting machines could influence the quality of the oil or damage the tree. Along with extra virgin olive oil, Doliva skin care products also contain natural ingredients like almond, avocado and wheat germ oils, vitamin E and shea butter. The fresh lemon and spicy olive scent gives it the Mediterranean essence. Independent dermatologists confirm the line's (from face cream to body balsam) skin compatibility.